It's been a very happy new year for a WinADay Casino player who hit a massive progressive jackpot just before Christmas. Steve M, a 30 year old IT worker, spun five Rainbows playing the Leprechaun Luck slot game and won $103,030. The site-wide progressive jackpot has now been reset and the one-of-a-kind online casino is giving players some bonus cash this week so they can try their luck at hitting their own jackpot. Bonanza Bonuses up to $500 available January 8 - 14, 2018. Although Steve has been playing at WinADay for awhile, he actually plays video poker games more than slots. 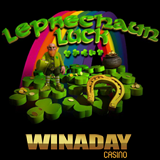 Leprechaun Luck is a 5-reel, 31-payline game with both Wild and Double Wild symbols. Players can wager as little as a penny or as much as $124 per spin and any spins betting $5 or more can result in a jackpot win. During regular spins, players collect special symbols and when they’ve got all four, a bonus game similar to Snakes and Ladders begins. Any time three or more Cauldron scatter symbols appear, players pick one of them to reveal an instant bonus prize. To celebrate Steve’s win, WinADay is offering all players special Bonanza Bonuses this week. Deposits of $35 - $500 will be doubled. May be redeemed twice. Valid for all slots and Keno. Wagering requirement: 23X. Valid for video poker games only. Available 4X per day. Wagering requirement 14X. WinADay Casino has been entertaining the world with unique slots, video poker, Keno and Roulette games for going on ten years. Most of its premium slots are tied to its site-wide progressive jackpot which was re-set to $50,000 after Steve’s win and is already approaching $70,000. Last summer, WinADay added Bitcoins to its options for deposits and withdrawals.